Do you think it’s weird? Is it boring? Maybe you think it doesn’t even matter. All of those responses are normal. But I want to open your mind to a world of different types of music. Music is an eye into the culture of a country. And for that reason, world music is super important. Every country and culture has its own type of music. Americans and Europeans have their own type of music, but those genres barely scratch the surface. As westerners, we can define world music as music that doesn’t fit our western traditions. That includes music from Asia, Africa, and South America. To better understand world music, we have to understand classical music. Classical music in the western world includes music by Bach, Beethoven, Mozart, Tchaikovsky, and more. Even if you’re not a professional musician, you probably know some famous classical works like one or more symphonies by Beethoven or Tchaikovsky’s The Nutcracker. While composers come from different countries, we all tend to categorize their music into the single genre known as classical music. That’s not a problem at all. But it can make it hard for us to understand how the rest of the world views music. Outside of the western world, music is ceremonial. It’s central to a country’s culture and traditions. People in African countries get everyone involved in music by forming drum circles. In Brazil, music is the backbone of Carnaval. Chinese music isn’t the same as Japanese music. Each country has its own musical identity. Sometimes, we see this in classical music when a composer uses folk tunes as their inspiration. But most of the time, we share one tradition across multiple countries. However, composers and performers can add a bit of their own culture to the music they write or play. American music is much more bold than in Europe, for example. Classical musicians can, and should, take inspiration from the music of other cultures. It can better our understanding of our own music, and we can learn more about different cultures and people groups. World music is important for many reasons. I would be lying if I said I only ever listen to classical music. Of course, I listen to other genres. If I hear a pop song I like, I’ll keep listening. You probably do that, too. Maybe not with pop, but with some other genre. So why is ethnic music any different? Classical musicians can learn a lot from listening to world music. Even if you never perform it yourself. More and more music schools now require a world music class. If you go into this class with a bit of understanding, it will make it much easier. I was lucky enough to attend a high school with a world percussion program. While I didn’t play in the group, I was able to hear them at the school concert each semester. The knowledge I gained from hearing the director and students talk about the music was super helpful when it came time to take a world music class in college. Even if you go into a world music class without that experience, you’ll come out of it with a lot of knowledge. We all know how interconnected the world is becoming. On Instagram, I have followers from the US, the UK, Brazil, and Italy, among others. You’ll probably encounter someone from another country if you haven’t already. Western classical music will probably remain the most “popular” in the western world, but music from other cultures will gain significance over time. Plenty of classical composers are now using music from other cultures as their inspiration. 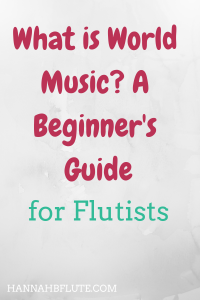 For flutists, David Loeb is an excellent place to start. He has written tons of music for flute based on East Asian music. I’m sure there are works for other instruments that take inspiration from other cultures. If you can approach these works with an understanding of the origin country or culture, you’ll be able to give a better performance. If you want to start your journey with world music, you’re in for some exciting stuff! There’s much more to music than what we study in school. I’ve found a few cool recordings this way. Listening to recordings is an easy way to get into world music. But it’s also a good idea if you’re playing music inspired by another country. For example, I’m working on the Taktakishvili flute sonata. Since Taktakishvili was from the country Georgia, I have listened to a few recordings of Georgian folk music. That’s helped me get an idea of what might have inspired the composer. Are you ready to play ethnic music? Well then get out there and find some pieces! I don’t know enough about other instruments, but flutists can start with music by David Loeb. If you play piccolo, then try learning his Six Preludes. For other instruments, you can do a Google search to find music inspired by other cultures. The possibilities are endless when it comes to instruments. If you play a woodwind, there are tons of ethnic woodwinds that you can buy. A lot of them are super affordable, too! Some ethnic instruments will cost a pretty penny, so maybe save those for when you know you’ll want to take the time to learn them. Have you played or listened to world music? What do you think of it? I think it’s pretty important. So much so that I’m considering specializing in world music and world flutes. Let me know if you want to see more content on world music! Also, leave a comment with any other blog post requests, and be sure to follow me on Instagram (@hannahbflute)! Next Next post: How to Clean Your Flute: What, When, Why?